A Mexican twist to the classic dish. Ideal for a light snack or as an appetizer, this Mexican style Shrimp Cocktail is refreshing and simple to make. 1. Heat 1/2 cup of water in a pan over medium flame. 2. Bring to a boil and add the shrimps. 3. Cook until opaque and cooked through. 4. Remove the shrimps reserve 1/4 cup of the water. 5. In a large bowl combine all the ingredients. 6. Add the reserved water and mix well. 7. To serve, divide the mixture between small serving bowls. 8. Top up with the avocado and garnish with the tortilla chips. 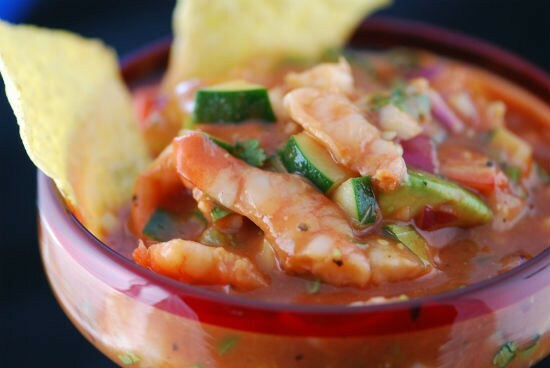 Feel free to comment or share your thoughts on this Mexican Shrimp Cocktail Recipe from Awesome Cuisine.